Givenchy Gentleman is a distinctive aftershave that lends a powerful, distinguished and rebellious identity to the traditional Eau de Toilette for men. Givenchy Gentleman aftershave has been created for men who are confident, proud of their appearance and excedingly contemporary. Givenchy Gentleman aftershave embodies the timeless art of masculine seduction. 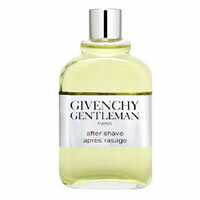 Givenchy Gentleman Aftershave seemlessly blends refreshing tarragon with a cinnamon spicy middle note and a dominant accord of vetiver wood and patchouli, over a honeyed and leathery accord that softens the very animalic end note.